Hours after winning their first-ever Stanley Cup, the Washington Capitals have returned home to a heroes' welcome. The Caps landed at Washington Dulles International Airport about 5 p.m. The plane taxied through the spray of celebratory water cannons. Alexander Ovechkin and Nicklas Bäckström stepped off the plane to cheers, hoisting the Cup over their heads as they grinned. Then, their teammates walked off the plane one by one. They're back! The Capitals landed at Dulles airport Friday evening. 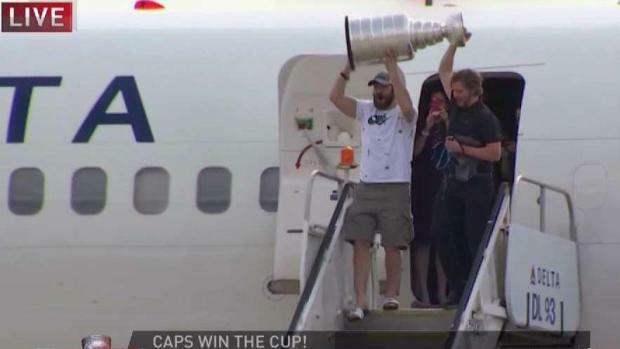 Alexander Ovechkin and Nicklas Bäckström hoisted the Stanley Cup the moment they stepped off the plane. News4's David Culver and Wendy Rieger were on the tarmac. Later Friday, T.J. Oshie, Tom Wilson, Devante Smith-Pelly and other players were seen celebrating at Don Tito's in the Clarendon area of Arlington, Virginia. A crowd of fans gathered around and cheered on Wilson as he lifted the Cup up high before entering the bar. Some fans told News4 they planned to stay at the bar all night until they saw all the players there leave the building where they were having a private party. The party will continue for the team on Saturday when they appear at the Washington Nationals game versus the San Francisco Giants. Ovechkin will throw out the first pitch at the 12:05 p.m. game. After the Caps won 4-3 on Thursday, Alex Ovechkin put both hands to his head and screamed while he left the bench and skated into the thick of the joyous celebration. 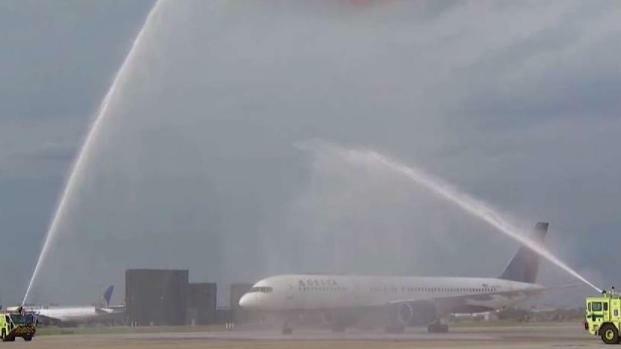 The Capitals were celebrated at Dulles airport on Friday with water cannons. News4's David Culver and Wendy Rieger were there. A day after the Caps' Stanley Cup win, fans were rocking the red at Dulles airport. News4's Aimee Cho spoke with a fire chief who wanted to be among the first firefighters in the area to welcome them back home. The streets outside Capital One Arena were filled with Capitals fans clad in red, cheering and dancing in the street to celebrate the team's first Stanley Cup championship in franchise history. 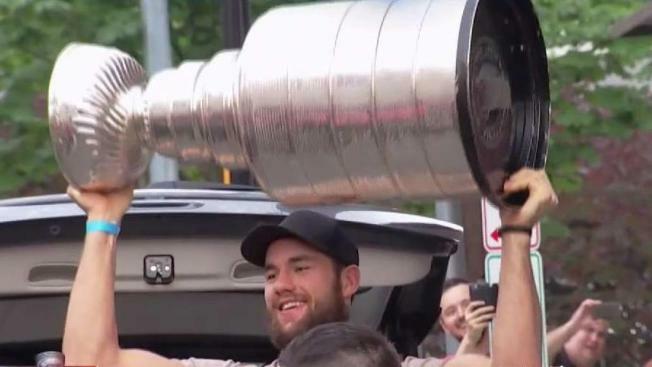 A victory parade for the Capitals is set to start Tuesday at 11 a.m., News4's Mark Segraves first reported. The celebration will roll down Constitution Avenue from 17th to 7th streets NW and will then turn right and end with an ALLCAPS rally at 7th and the National Mall, Monumental Sports, the group that owns the team, announced Friday afternoon. The parade will be free and open to the public. Planners are encouraging fans to take Metro or rideshare and to bring plenty of water. More details about the rally, including speakers, are still to come, planners said.